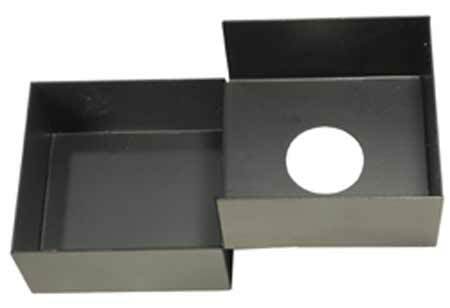 Four-sided box, which hangs off the rear of the ram guide plate and holds ejected material. To install the new Catcher Tray, slip it over the swage die in the press ram! To dump it, just lift it off. (The previous version had a mounting hole that went UNDER the die and was clamped against the ram plate, but this interfered with quick dumping and replacement as well as the sync length of special point form dies). Please note that the catcher tray does not need to be "secured" or parallel to the ram plate: it actually works better if you just let it hang at a slight angle, held by the die but easily removed. The angle lets extrusions or primers roll or slide down into the "box" portion more easily. The Catcher Tray can also be used with type -R and type -S bullet or jacket reducing dies as well as -H type, by hanging the unit on the top of the draw die, at a slight angle with the 1-1/2 inch hole over the die top. The jackets or drawn bullets emerge from the top of the die and, instead of you having to catch them or letting them fall to the floor, they will drop into the catcher tray. When the tray is full, you can lift it off and pour the content in to another container. 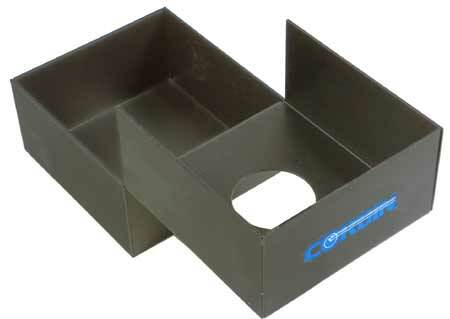 The CHP-T Catcher Tray can be ordered from the Corbin Web Store.